Th-INK-ing of You: Welcome to the ODBD Feb. Release! Hello friends! Welcome to the ODBD February release! If you missed the pre-release, you are in for a treat! You can see the full release HERE. As always, there will be prizes for those who visit the designers blogs and leave a comment on this release. Three randomly selected winners will each receive a $25 Gift Code to the ODBD Website! You have until February 2, 2017 at 9:00 p.m. EST to leave your comments on the Designers Blogs for a chance to win! The Winners will be posted on the ODBD Blog on February 3rd, so be sure to check back there to see if you won! 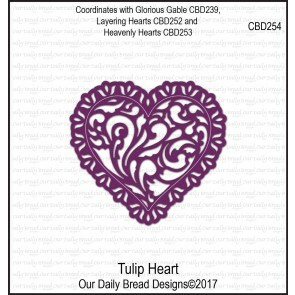 For the Card: Glorious Gable Box, Tulip Heart Dies, Layering Hearts dies, Love Script die, and Pierced Rectangles dies. It's pretty self explanatory but just in case you are wondering what the vertical die cut panel is on the card.... that is the top of the Glorious Gable Box die, cut and matted with silver. I love that! Both my panels are popped up with dimensional foam tape. The Love word die finished it off. For the Box: To My Favorite set, Glorious Gable Box, Layering Hearts dies, and Mini Tags dies. The box is very easy to cut out, and positioning the dies for the fancy cut out is not hard at all. I did use a bit of removeable tape once I had them evenly fitted in my gable box sides. I cut the silver paper with the Layering hearts (the largest one) and then cut the love word die from white. The little tag on top says Love and has a little heart, both of which are heat embossed with silver. I tied a thin silver satin ribbon on to hold the tag, which was cut with the Mini Tags dies. Now be sure to visit the other designer's blogs for more inspiration and your chance to win! Grace, your projects are wonderful, as always! Your color choices here make your projects so elegant. Just beautiful! Your projects are beautiful. Color choices are wonderful, thanks for sharing. Stunning, Grace! Very elegant, beautiful color choice. Wonderful samples!! Your card is very beautiful!! Such a lovely use of the elegant die! 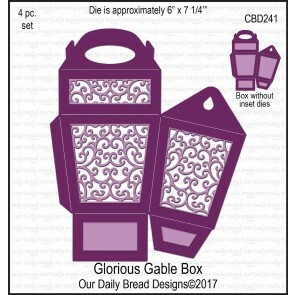 your gable box is stunning! These are beautiful! Love the scroll die cuts. The love die is also very pretty. I agree with the previous comments that they would be wonderful for wedding projects. such pretty projects! I have problems with so much white...it never stays that way with my inky fingers! thanks for sharing! Oh my goodness Grace! Your card and box are absolutely lovely! Love both! You right, these samples are very elegant. The use of silver, and the instructions die look great on the card. 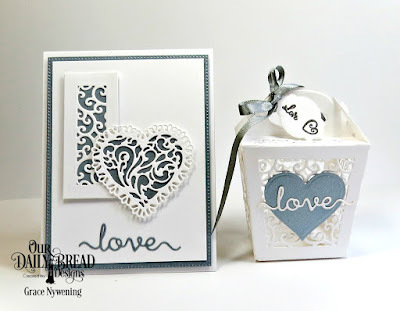 Your gable box and card are so beautiful! I love the white and silver color combo you used! I really like to see some empty space on projects; I think the images and embellishments stand out so much better than when things are crammed with stuff; nice job! Beautifully done. And again, I really like your color choices! Grace, your blue and white is so pretty!! 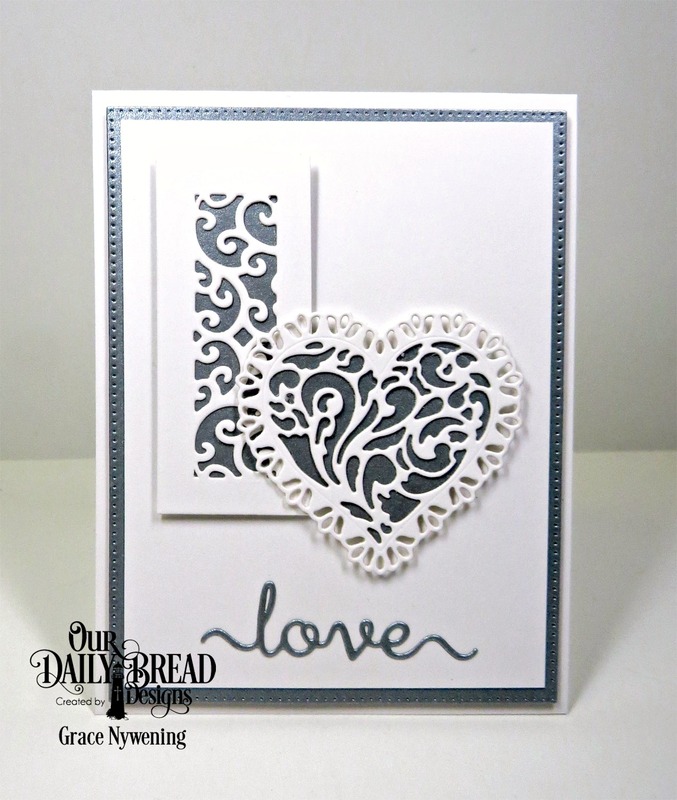 I love how you used the top inset on your card as a lifted piece and your pretty heart! 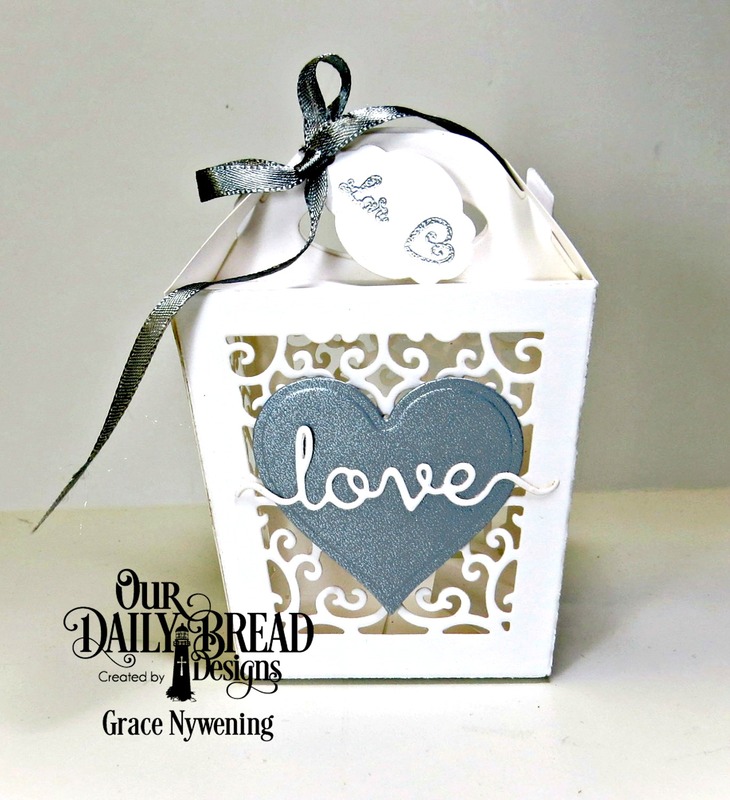 Love your sweet box too! Hope you are comforted today sweet friend. I love you! Lovely projects! Great job as always! Love the beauty and elegance of the colors you chose. Beautiful work. The box and card look so stunning using white and silver! Truly stunning! Gorgeous card and box. So elegant...both of them! Your card and box are gorgeous Grace!! I just love the white and metallic silver combo! Your die cuts just pop!! Stunning and so elegant my friend! You are always an inspiration! Praying you had a good day!! Thinking and praying for you!!! Oh so beautiful. This Gable Box is so gorgeous. I love your card and box. I just love how you made the card and the white is stunning. Love your matching projects, they're so pretty! Thanks for sharing. Very pretty and delicate! Love the blue! Love the projects, so pretty and elegant. these are both so elegant! Beautiful card and box Grace - I love that you have used blue and white for your colours!! The card is a real joy to behold. Praying that your health is still improving. Your gift set is just stunning and so elegant, Grace! 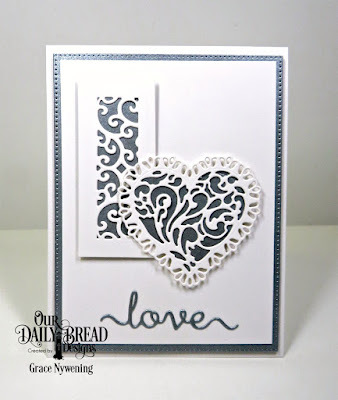 The silver and white is beautiful and I love the addition of the delicate love die! 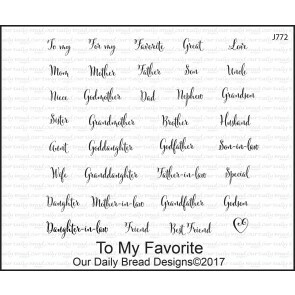 Beautifully designed, my sweet friend! Hugs! as always I would expect nothing less, then your beautiful creations.